Cake with Chocolate (11 %), Milk Chocolate (5 %) and Chocolate Pieces (6 %). Suitable for vegetarians. 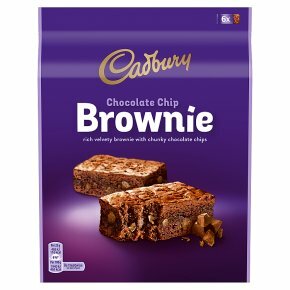 Rich velvety brownie with chunky chocolate chips Unwrap and enjoy one of our delicious velvety brownies, with chunks of rich Cadbury chocolate baked in for an indulgent treat to savour.